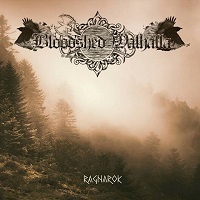 The four texts of BLOODSHED WALHALLA’s "Ragnarok" album, have been written by Drakhen and tell about the final battle between the gods and the order of evil and darkness, from the early signs to the destruction of the world and its regeneration. Naturally, Drakhen, besides the known legend, added his own by including a parallel story entirely created according to the events. God Baldr, Odin's son after being killed by Loki deception, is welcomed in Hel's realm. The Queen of Evil listening to the desperate crys from all creation and the supplications of the Odin God for his son to be released, decides to imprison the father of everything in his cells and send his son Baldr into the world of the living by making him so deadly and devoid of Strength. Odin accepts these conditions. By removing Odin, the queen sends the warning signs that the Ragnarok will eventually cause. Odino enters into the dreams of his now dead and unconscious son of all that has happened and that will happen and reveals his plans, delivering his strength, his Slipnir horse, his spear and his helmet. Baldr will have to donate his mortal heart to the valkyries, and after his second death he will be able to enter the walhalla and finally understand who he is and his real identity! Baldr will thus have to reach Hel's kingdom and with his Odin's skills and weapons and strength, he will have to destroy the queen of evil and his army in order to free his father from the black cells. The Ragnarok with Odin and her children can get started! We find this story in the lyrics of the 4 tracks of the album! This is not just an album, or a selection of songs, but, it’s the story of Ragnarok itself. The sound effects of the horses and battling are amazing, along with the different styles: Viking, Folk, Death Metal. Its hard to describe this as just a song, but at the same time, its mesmerizing. The atmosphere builds and dips throughout, as if it is a story audiobook. The melody is phenomenal! The entire album is just one truly amazing piece of work. The instruments are played so well, mixing different styles. Trying different levels and heaviness in vocals to add to the atmosphere and depth into the songs. Because the album has so much going on, it cannot be listened just as a song, but as its own symphony.